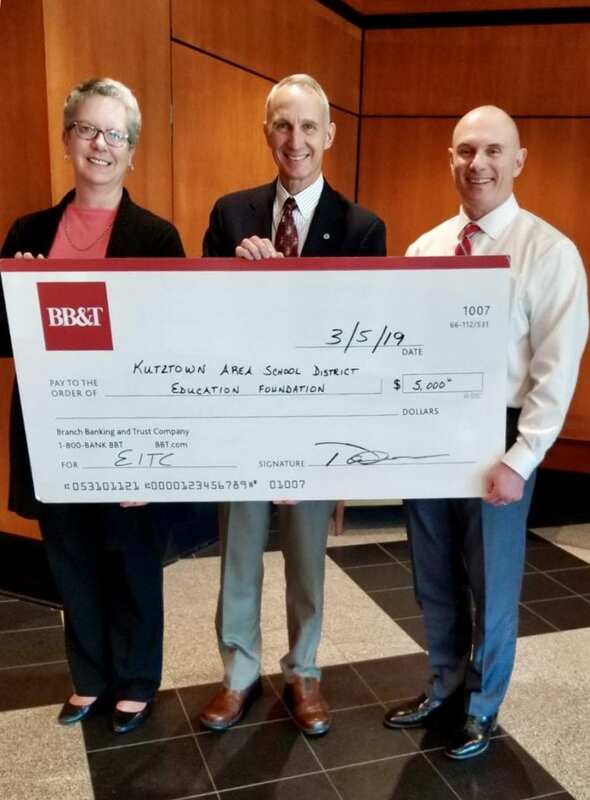 BB&T recently donated $5,000 to the Kutztown Area School District Education Foundation through the Educational Improvement Tax Credit (EITC) program, which is run by the Pennsylvania Department of Community and Economic Development. Proceeds will be passed on to the Kutztown Area School District in support of Educational Improvement programs. Under the EITC program, tax credits may be awarded to businesses that make contributions to approved Educational Improvement Organizations, such as our Education Foundation. Businesses wishing to inquire about participation in this program, please check out this link: Educational Improvement Tax Credits (EITC) – Kutztown Area School District Education Foundation Or feel free to contact us at: KASD Education Foundation: 610-683-7361, Ext. 5105. Ed. Foundation Vice President, Steve Fenstermacher, represented the KASD Education Foundation by receiving BB&T's donation from BB&T's Ms. Carey Babczak, Vice President, Business Services Office and Mr. David Roland, SVP, Market President, Berks/Northern Montgomery Counties.